The Reina Group have been shortlisted for the Renewable Road Show 2012 event in three categories. The Renewables Awards will be held at the Ricoh Arena on Thursday 13th September and guarantees a first-class evening of entertainment. This year it will be hosted by top television presenter Gabby Logan. 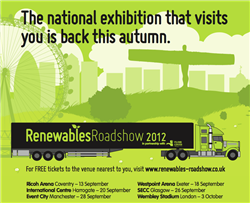 Please click here for further information on the upcoming renewable road show events.